Family: Arecaceae Origin: Southern US, Caribbean, Cuba, Mexico, and Central America. Another tall and stately palm, this time originating from the subtropical and tropical regions of the New World, Cuban Royal palm is a beautiful and adaptable tree perfect for many uses. In its native lands, it’s used for lumber and thatch, as well as a base for medicines. The fruits are highly attractive to wildlife and it’s often used as a plant that makes fodder for farm animals. The flowers are loved by pollinators, including bats and birds, and are relied upon as a roosting tree for many birds to raise their young. As the national tree of Cuba, the fronds are used in Christian religious ceremonies, most notably as decoration on Palm Sunday. The roots of this palm in India have been found with colonies of a special nitrogen fixing bacteria among them, much like a legume naturally has, which improves and adds nutrients to soil. An important tree indeed! 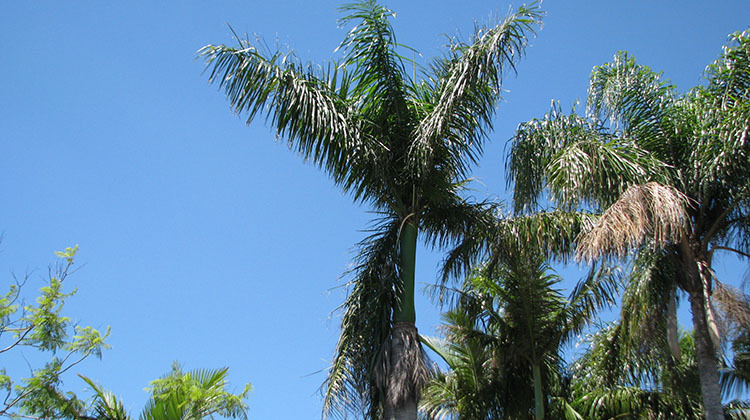 This palm can reach a very large size, around 30 metres in height, sometimes taller in its native environment. The overall shape is long, tall, and pleasing with an open round shape on the top. The trunk is always smooth and naked, greyish in color. There’s a bulge just below the crownshaft, characteristic of this palm. The base is a beautiful shape and often seen in photographs, with a slight flare at the bottom. Sometimes when this tree grows in a small close colony, the stems are shaped together beautifully. They have a green crown shaft. The inflorescences are borne on drooping stalks and are white. The flowers are much loved by pollinators of all kinds. The leaf fronds are long and drooping, reaching 4 metres in length. Each tree usually sports about 15 of these leaves from the crownshaft. The Cuban Royal is self-cleaning. They are considered dangerous for their sheer size and weight when they fall for anything in their proximity. The fronds don’t have spikes along their edge though can be quite sharp. The fruits of the Cuban royal palm are round or slightly ellipsoid in shape, starting green when first formed and ripening to black. This palm is easily started from fresh seed, picked after the seed is ripe and removing the flesh around the outside. Some scarification may be necessary for faster germination, as the seed does well eaten whole by animals and dispersed after moving through the digestive tract. This natural scarification should be emulated for faster and more reliable germination of the seed. This tree is very tough and can withstand many growing conditions. Grown often in urban settings and in gardens, this is an ideal specimen tree for many uses in the city- in parks, around buildings, and along roads. It enjoys lots of sun and water, but can tolerate less water if it has to. It does better in some shade when young, but when older it becomes a more dominant palm and needs full sun exposure. There are said to be many cultivar variances based on natural global distribution and island isolation in some cases. Botanists have classified this palm as one single species but sometimes refer to natural places of origin to distinguish some individuals from others. On the other hand, they should not be planted close to anything that could suffer damage from their large fronds when they fall. They are perhaps the largest palm for mass, considering their girth. The foxtail palm tree is a great native substitute for the Cuban Royal. We have a foxtail palm 2 metres from our above ground pool and so far (16 years) no problems. Also right next to a brick wall, pathway and large garage with cement floor and no problems. They may have been there for at least 20 years. Could we have trouble in the future? Hi David. I have Two Cuban Royal Palms in good health. Are they worth anything? Is so who would buy them? Can the roots of the royal palm damage a pool if planted within 2 meters of it? Hi Rhonda. Yes, they can. They need to be more than the height of the mature tree away from the pool. How much further depends on your soil type.